This switch can set setting pressure by turning a volume with scale. It can be used for various use for detecting powder and dust air pressure with a filter. Many pressure ranges and lots of proprietary accessories are available including metal tips for connecting to a metal pipe (MS65 only), and a rotating metal tip (MS65 only). 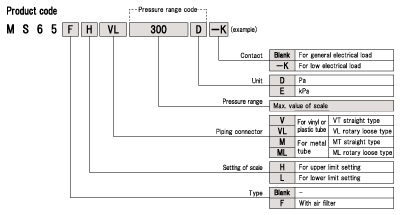 Two types are available, for setting upper and lower limit pressures, and two ratings (for general electric loads and low voltage current). 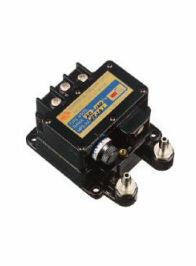 ・Built-in micro switch has high reliability and high electrical rating of contact. ・Even when the pressure becomes excessive, the original mechanism avoid damage to the moving parts. ・Small hysteresis is realized by the silicone rubber diaphram. ・High-performance air filter prevent the incorrect action of the contact under severe condition. ・It is easy to wire by the 3P mini-clamp connector produced by 3M Co., Ltd.
・To use specify the product for low electrical load of micro differential pressure swithes and combine. * The product above is made by Yamamoto Electric Works., Co., Ltd.